Welcome to another installment of our new Cozy Living series! 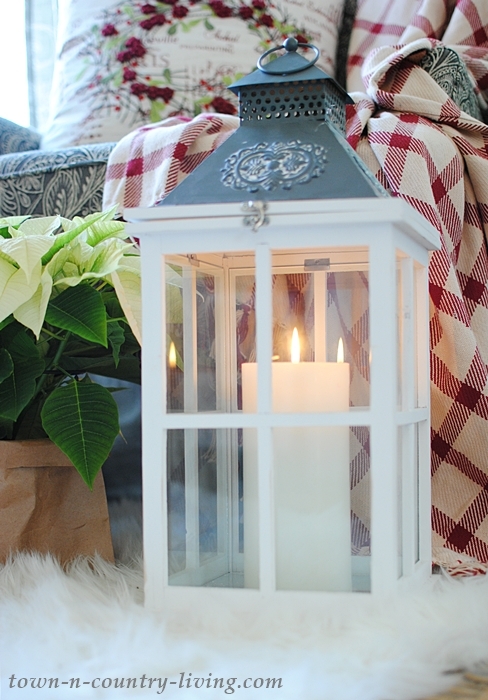 In November I shared how to use candles and blankets to make your home warm and fuzzy. 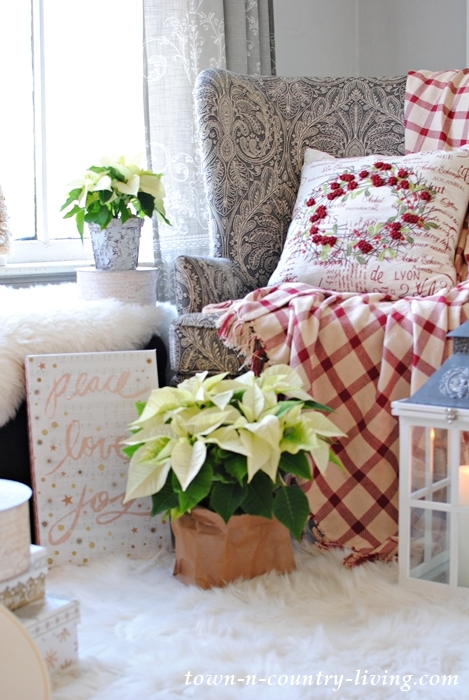 Today I’m sharing my cozy corner by the Christmas tree. My cozy blogging friends have ideas for making your home cozy, too. Their links are at the end of this post and I know they all have great inspiration to share with you. When I was a little girl I’d run home from school, turn on the Christmas tree lights, and just sit there and gaze at the tree. In the evening after dinner, Christmas music played while I’d enjoy my spot by the tree and fireplace. A nine to ten-foot real flocked live tree graced my childhood living room. The tree stand rotated and played music, slowly spinning the Christmas tree, and I was mesmerized by the magical experience. Today I still feel the same way about Christmas trees – much like Kevin in Home Alone. Christmas just wouldn’t be Christmas without a twinkling tree. And so this year I created a cozy corner by the Christmas tree just for me. A new lantern casts a cozy glow while I sit in this spot and read, or just gaze at the tree and daydream. 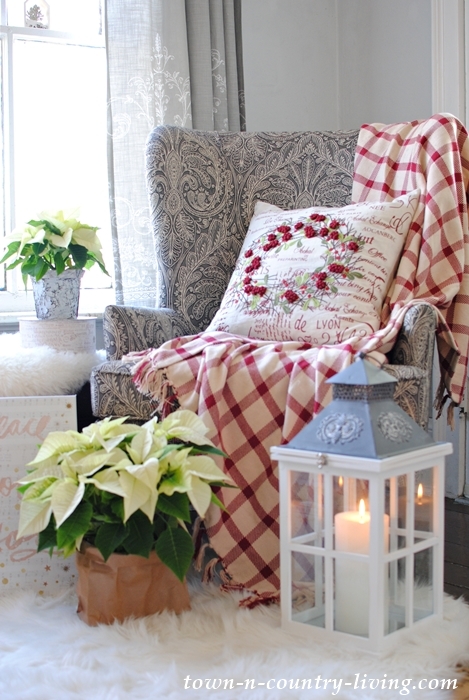 A Christmas throw provides warmth on chilly evenings while a holiday wreath pillow adds a little comfort. Small touches make a big difference when creating a comfortable home that you love. 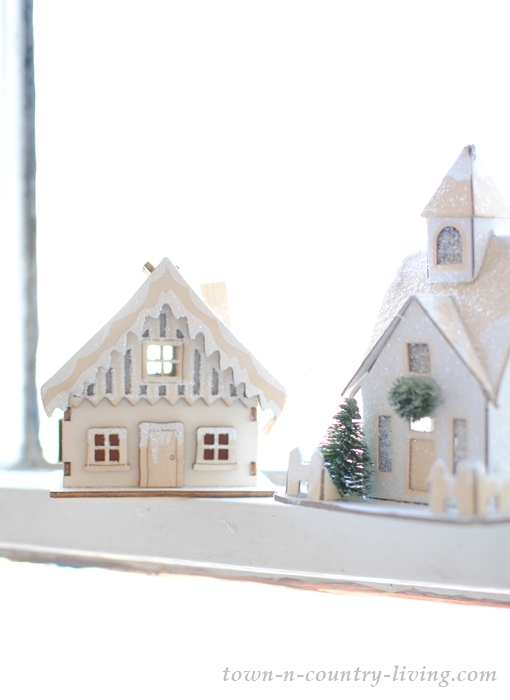 Miniature wood and paper houses line the windowsills near the tree. 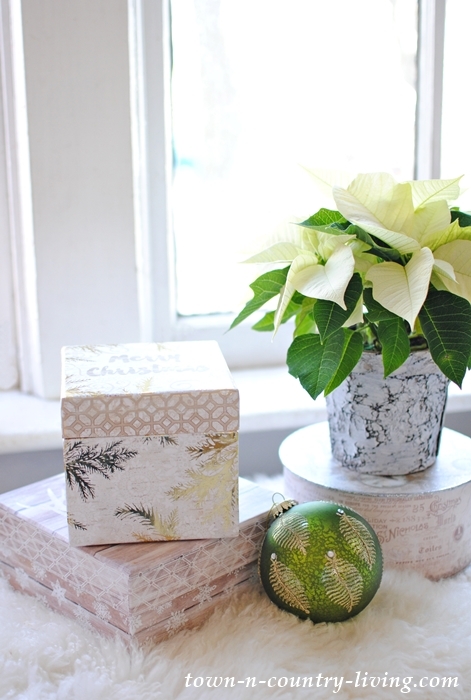 Pretty holiday boxes are strewn about waiting to be opened on Christmas morning. As a child I would beg to sleep in the living room by the tree on Christmas Eve. I never believed in Santa Claus. My mother felt the fantasy of old Kris Kringle robbed the holiday of its true meaning – the birth of Christ. I wasn’t waiting for Santa’s arrival; I just wanted to be near the beauty of our tree. 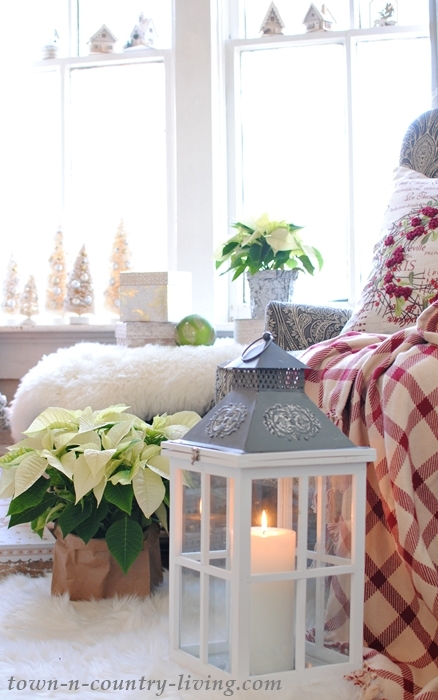 Do you have a cozy corner by the Christmas tree? 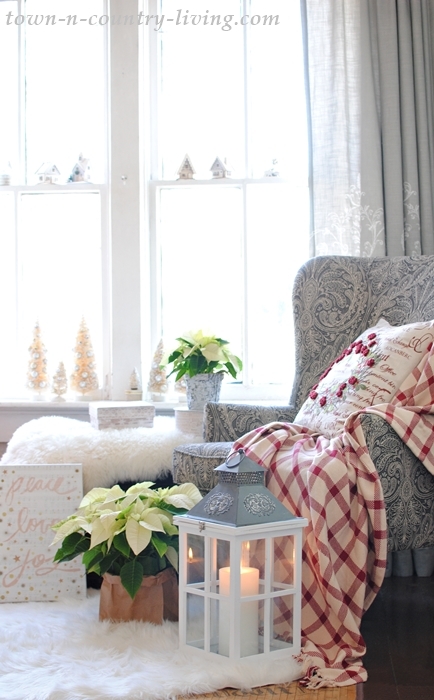 A big comfy chair is a great place to unwind and de-stress from the hustle and bustle of the holidays. 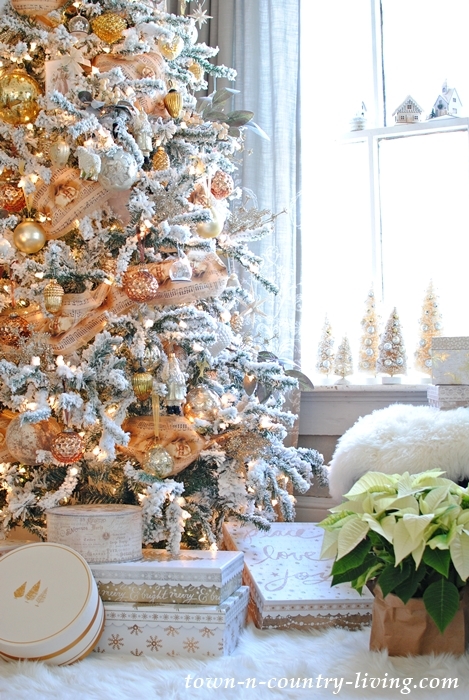 Visit this year’s Christmas home tour. Grab a cup of coffee and then visit my Cozy Living friends below! Where did you get the adorable red throw and Christmas pillow? Love your blog and style!! The pillow is from HomeGoods. I just simply LOVE this, Jennifer! Definition of cozy! Btw, where did you find the lantern? Hi Kathi! I found the lantern at Old Time Pottery. They had several colors and styles available. Your home is always cozy. My cozy spot this time of year is on the sofa in the living room looking at the fire, lights on the mantel, our fun Charlie Brown Christmas tree, lights outside… Our house seems cozier because of all the garlands around the house, extra Christmas pillows on the furniture and a Santa Claus in every room. I love the coziness of this time of year. I could spend the entire Christmas season curled up in that cozy corner! LOVE it! 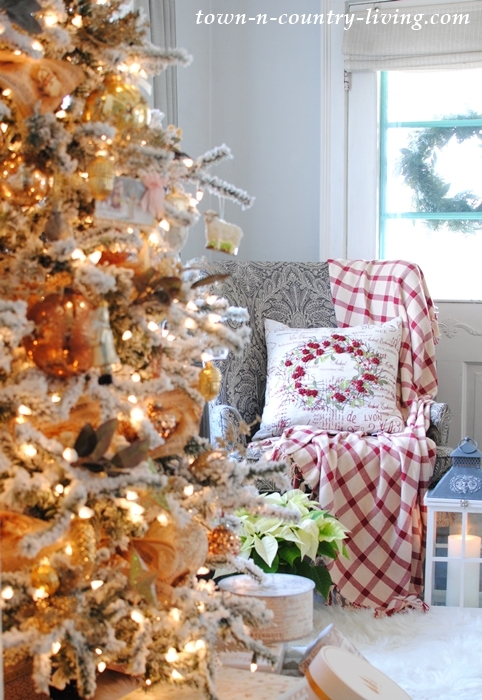 Oh my goodness, your tree is stunning and your cozy corner is the perfect spot to curl up and have some magical you time! I adore your childhood memories! I had no idea you could flock a live tree! I think my husband may be mad with you when I tell him you told me that! 😉 Kidding! But, I may be flocking my live tree! How cool! I think that’s one of the nicest and most inspiring comments I’ve ever gotten on my blog … “Thanks for allowing the Lord to bless us through the gifts that He put in you.” That really means a lot to me. Thank you so much for your encouragement and exhortation! Hey Jennifer- everyone needs a cozy corner in their home or in their life. i hope you will enjoy yours lots during the holiday season. What a beautiful little spot and a beautiful tree! There’s something so magical about a Christmas tree. I feel the same way. Ya gotta soak it in as much as possible because it’s over much too quickly. 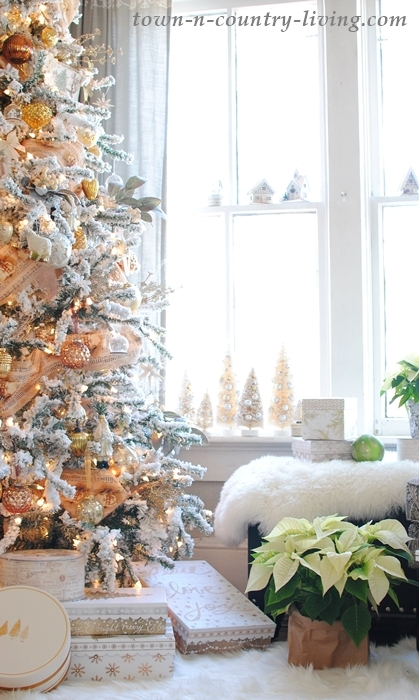 I love this idea of a spot by the tree just for you! 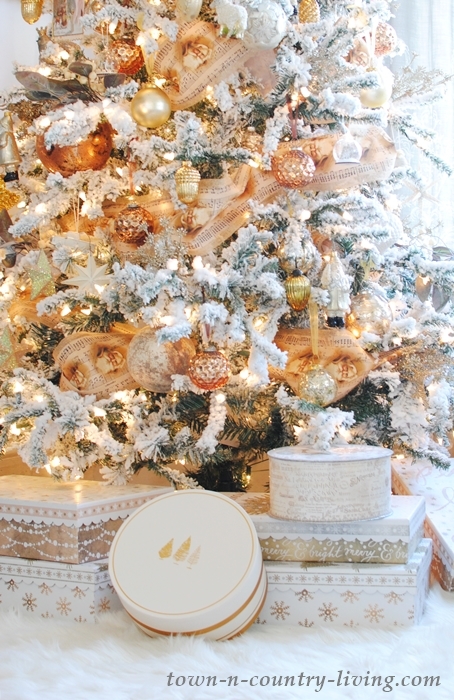 Your tree is stunning, love the ribbon! Your cozy corner looks amazing!!! Absolutely Beautiful …… That tree is stunning !!! I love that “perfect” place to get comfy and enjoy the tree at Christmas!! !